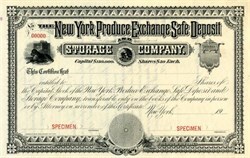 Beautifully engraved RARE specimen certificate from the New York Produce Exchange Safe Deposit Storage Company dated 1909. This historic document was printed by American Bank Note Company and has an ornate border around it with a vignette of a dog in front of a safe. This item is over 107 years old. The New York Produce Exchange had nearly 1900 members. Besides grain, it dealt in many other products, including hay and straw, cotton seed oil, flour, provisions, lard, seed, petroleum, pig iron, hops, butter and cheese. The Exchange also took an active part in furthering New York's commercial interests and had committees on canals, bills of lading, exports and railroad affairs. The exchanged was liquidated in December 1943. The New York Produce Exchange was organized in the year 1861, and incorporated in 1862. The new Exchange Building is located on Broadway, , Whitehall, Beaver and Stone streets, and is one of the most complete and imposing structures in New York City. It was commenced May ist, 1881, and completed May ist, 1884. The corner stone was laid June 6th., 1882. It is built of granite, brick, terra cotta, and iron. Its dimentions are 300 by 150 feet. The cost of the land and building was three million dollars. The Exchange Room is 220 by 144 feet. The ceiling 47 feet 6 inches high; and under the skylight 60 feet. The girth of the outside walls are nearly one-fifth of a mile, containing seven and a half acres of floors. In its construction twelve millions of brick, fifteen miles of iron girders, one and three quarter miles of iron columns, and two thousand and sixty-one tons of terra cotta were used. It has over two thousand windows and nearly one thousand doors, seven and one half miles sash cord, and chains requiring over forty seven tons of sash weights. The skylight over the exchange room is one fifth of an acre in extent. The building is heated by twenty-nine miles of steam pipes. It has nearly one mile of paneled wainscoting. Nine hydraulic elevators carrying an average of twenty-one thousand five hundred people daily, or six million five hundred thousand a year: the pumping capacity for supplying water is sufficient for a city of one hundred and seventy five thousand people. There are one hundred and ninety offices, in the building, rented for one hundred and seventy five thousand dollars per annum, a premium of over twenty thousand dollars was paid for the first choice. The tower clock has a dial twelve feet in diameter, the hands are six feet in length, the numbers twelve inches and the weight three-quarters of a ton. It is two hundred and twenty feet from the sidewalk to the coping of the tower, and three hundred and six feet to the top of the flag staff, which is ninety feet long, and carries a flag fifty by . thirty feet, said to be the largest ever made. The horse power used per year for heat and power is about one million two hundred thousand.